How do we calculate the amount of torque produced by a given force? Since it depends on leverage, we should expect it to depend on the distance between the axis and the point of application of the force. We'll derive an equation relating torque to force for a particular very simple situation, and state without proof that the equation actually applies to all situations. The simple physical situation we use to derive an equation for torque. A force that points directly in at or out away from the axis produces neither clockwise nor counterclockwise angular momentum. A force in the perpendicular direction does transfer angular momentum. Consider a pointlike object which is initially at rest at a distance r from the axis we have chosen for defining angular momentum. We first observe that a force directly inward or outward, along the line connecting the axis to the object, does not impart any angular momentum to the object. 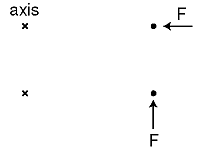 where r is the distance from the axis to the point of application of the force, and F? is the component of the force that is perpendicular to the line joining the axis to the point of application. The geometric relationships refered to in the relationship between force and torque. The equation is stated with absolute value signs because the positive and negative signs of force and torque indicate different things, so there is no useful relationship between them. The sign of the torque must be found by physical inspection of the case at hand. From the equation, we see that the units of torque can be written as newtons multiplied by meters. Metric torque wrenches are calibrated in N·m, but American ones use foot-pounds, which is also a unit of distance multiplied by a unit of force. We know from our study of mechanical work that newtons multiplied by meters equal joules, but torque is a completely different quantity from work, and nobody writes torques with units of joules, even though it would be technically correct. |τ| = r |F| . Of course you would not want to go and memorize all three equations for torque. Starting from any one of them you could easily derive the other two using trigonometry. Familiarizing yourself with them can however clue you in to easier avenues of attack on certain problems.